The cold wind is sneaky in this city. It crawls underneath and in between your layers. It wiggles under your collar and hugs your winter knees. The cold wind is sneaky and I’ve become a chain tea drinker as a result. Unfortunately, the wind always wins and now I’m pretty sure I have a fever. 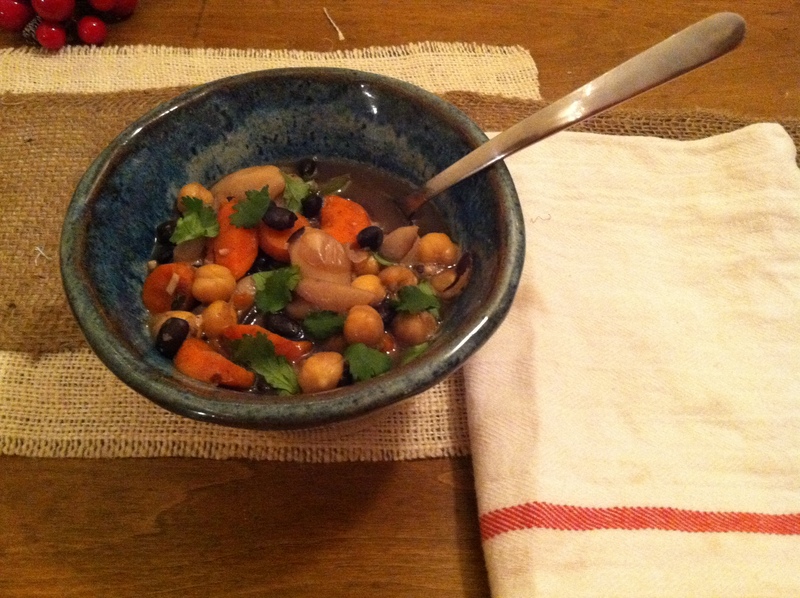 Obviously, the remedy is a big bowl of bean/carrot/garbanzo soup with rosemary, thyme, and cilantro. That and tea and the classic White Christmas. Obviously. Read, friends and be encouraged by someone else’s words. Second-thank you. I was just flippin through your blog and came across a post from Feb of this year “saying no to things we like in favor of things He loves.” I have been struggling mucho with this lately! It seems that I fit really well into this world. Like I fit easily into the clothes of the world and I am rewarded for it by people who are deemed important by worldly standards. It’s easy for me to be admired for my looks and funny things I say. I learned early on that to make people laugh is a gift, but it is easily used incorrectly and for selfish gain. This isn’t bragging, it’s honestly a struggle. It’s a struggle because I know the truth that all these things that are so easily admired are nothing, and momentary. Yet in the moment the instant gratification is intoxicating. The weight of it becomes fraudulent as if people are going to find out that I am a liar. Well, I am. And a sinner, and selfish and a long list of other things. And how it seems terrifying to be found out, but in reality there is freedom in that truth. I have been wrestling in the legalism of “acting right” vs “acting wrong” and it drives me crazy. But your post helped me to put down my judges gavel for myself and realize that to be obedient shouldn’t feel heavy. And if it is that I need to give it away. The price has been paid. To remember that to treasure Christ is worth more than momentary popularity. There is joy in the messiness and imperfection and that I am wonderfully made. That taking up my cross may seem heavy but that I’m not doing it alone. This entry was posted in anecdotes, creativity, lessons learned, Life Insight, this is me, Thoughts. Tagged advent, Christ, Christian community, Christian life, Christianity, Christmas, Encouragement, White Christmas, winter. Great post, great reminder and pick me up. Thanks – wish I needed to be reminded less, but I’m just glad for God’s grace to remind me at all!